Electric Run 2014 | JustRunLah! Skechers Electric Run is the World's Premier Nighttime run/walk experience, where the participants are an integrated part of the show. 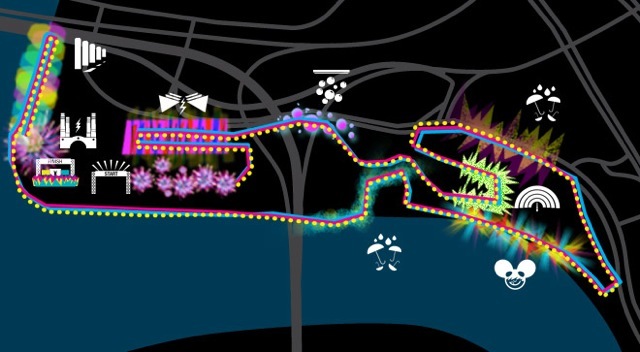 Featuring immersive "Lands" of light and sound that transport the participant into an electric wonderland, Skechers Electric Run promises to transport the mind, body and soul to a new world in a healthy and drug-free way. Participants are encouraged to join in on the art by lighting up with glow sticks, LEDs and anything else their imagination can conjure up. • Includes Runners’ Pack of an Electric Run® T-shirt, Skechers Bag, race bib, LED bracelet and pair of glow glasses.